SMU Head Coach Chad Morris’ Second Season Should Have Mustangs Fans Excited. 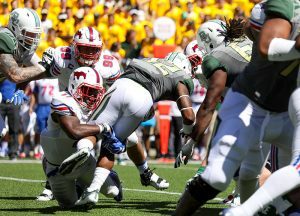 Heading into Saturday’s game in Waco, the SMU Mustangs were a 32-point underdog against the No. 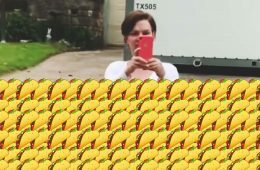 23/19 Baylor Bears. And yet, at the end of the first half, the Mustangs were clinging onto a 6-6 tie. 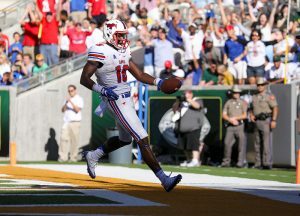 It was the second time in as many seasons that SMU head coach Chad Morris and his team had Baylor on its heels. 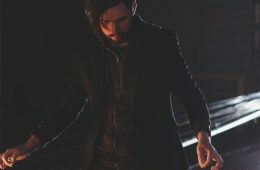 Sure, Baylor would eventually pull away in the second half en route to a 40-13 victory — but, two games into his second season, Morris’ program is showing signs of real progress. 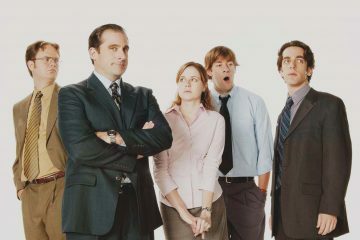 Mustangs fans should be stoked. 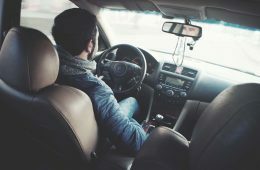 When SMU introduced Chad Morris as its new head football coach in 2014, the former Clemson offensive coordinator laid out hefty proclamations about his upcoming tenure. 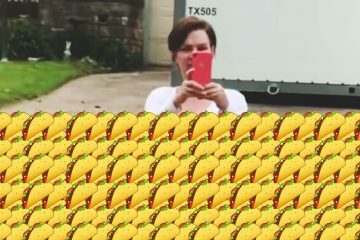 Among them? 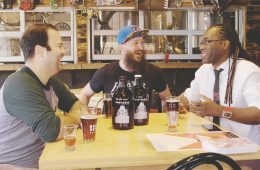 Morris promised that he would heavily recruit the Dallas-Fort Worth area, that the Mustangs would play fast (coining the “Pony Up Tempo” term) and that SMU would undergo one of the biggest turnarounds in college football. 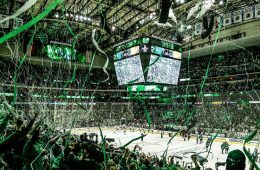 After a full season of recruiting and implementing a brand-new system — along with his second straight dismantling of the University of North Texas and another competitive effort against Baylor on Saturday — flashes of Morris’ vision for SMU football relevancy are growing more apparent. 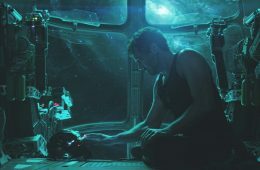 Just take a look at the roster. All the high school players from Morris’ two recruiting classes are from Texas, making SMU the only FBS school in the country that can claim that honor. And those young players have been integral in implementing Morris’ fast-paced spread offense with a lot of freshman and sophomores earning starting spots. 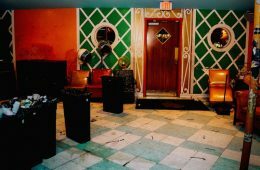 After senior quarterback Matt Davis suffered a knee injury against North Texas, redshirt freshman Ben Hicks made his first start Saturday and played admirably. In the first quarter, he looked composed while throwing accurately and delivering the ball quickly. 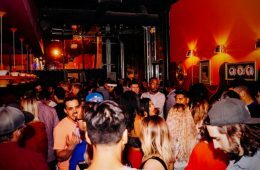 Hicks relied heavily on standout sophomore wide receiver Courtland Sutton, who had 77 receiving yards in the first quarter, to move the offense down the field on their early possessions. 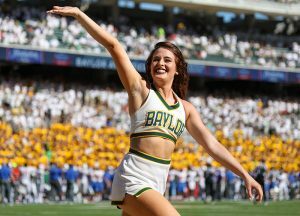 It’s clear to see this season that the team is more comfortable with Morris’ fast-paced offense; against Baylor, they sometimes snapped the ball less than 10 seconds after the previous play. 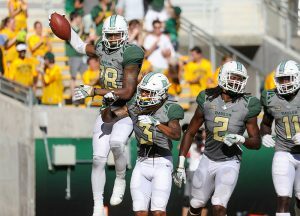 Key drops by receivers and red zone interceptions killed huge opportunities for the Mustangs to take a big lead over Baylor, but it was a commitment to the system that put them in those positions in the first place. 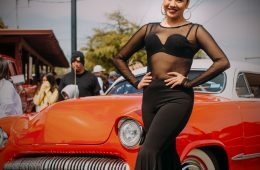 On the other side of the ball, the Mustangs defense smothered the Bears’ running game in the first half and put plenty of pressure on Baylor quarterback Seth Russell. 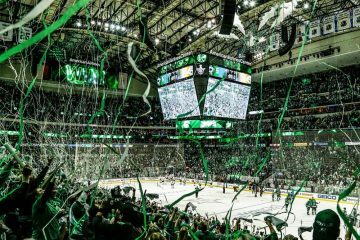 In the second half, of course, the defense began to wear down, as SMU couldn’t keep up with Baylor’s depth — as could be expected. Still, the future is bright. SMU got big contributions from its young players on Saturday. Sophomore Braeden West and freshman Ke’Mon Freemon led the team in rushing with a combined 176 yards, averaging 5.1 yards per carry. Redshirt freshman James Proche led the team in receptions with seven catches for 84 yards. And that’s the goal, really. SMU plays its first home game of the season next week against FCS school Liberty University at Ford Stadium. 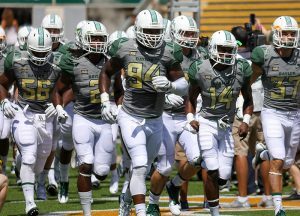 Baylor Bears defensive end Xavier Jones (94) leads his team onto the field to face the SMU Mustangs at McLane Stadium in Waco, Texas. 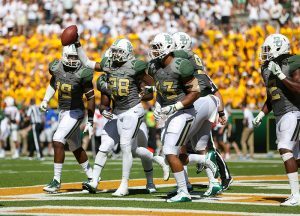 The Baylor Line celebrate after a defensives stop in the first quarter against the SMU Mustangs at McLane Stadium in Waco, Texas. 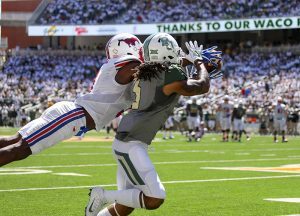 SMU Mustangs wide receiver James Proche (3) leaps to make a catch near the sideline against a Baylor Bears defender in the first quarter at McLane Stadium in Waco, Texas. 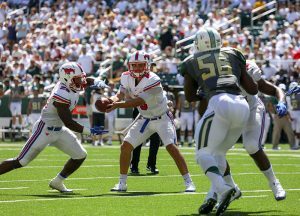 SMU Mustangs quarterback Ben Hicks (8) hands off to SMU Mustangs running back Ke’Mon Freeman (29) during the first quarter against the Baylor Bears at McLane Stadium in Waco, Texas. In his first career start, the redshirt freshman threw for 229 yards on 17 completions, 1 touchdown and 3 interceptions. 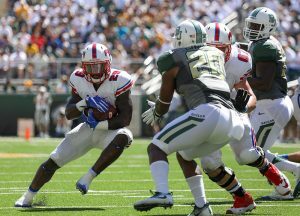 SMU Mustangs running back Ke’Mon Freeman (29) rushes through the line of scrimmage against the Baylor Bears at McLane Stadium in Waco, Texas. SMU Mustangs linebacker Kyran Mitchell (11) wraps up Baylor Bears running back Shock Linwood (32) behind the line of scrimmage during the second quarter at McLane Stadium in Waco, Texas. Mitchell, a true freshman, recorded 8 solo tackles in the game. 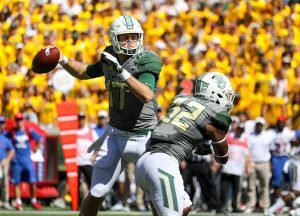 Baylor Bears quarterback Seth Russell (17) attempts a pass during the second quarter against the SMU Mustangs at McLane Stadium in Waco, Texas. 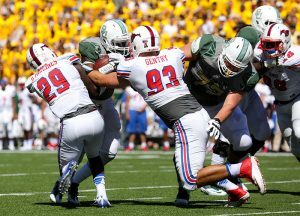 SMU Mustangs defensive back Darrion Millines (29) and defensive end Mason Gentry (93) wrap up a Baylor Bears ball carrier behind the line of scrimmage at McLane Stadium in Waco, Texas. Millines led the team in tackles with 10. 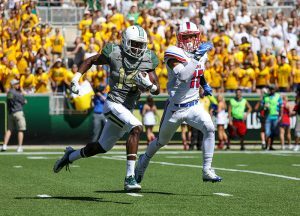 Baylor Bears wide receiver Chris Platt (14) pulls away from SMU Mustangs defensive back Jordan Wyatt (15) during the second quarter at McLane Stadium in Waco, Texas. 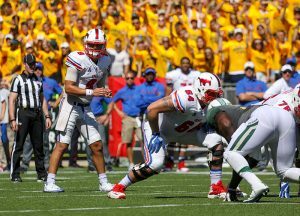 SMU Mustangs quarterback Ben Hicks (8) reads the Baylor Bears defense pre-snap at McLane Stadium in Waco, Texas. 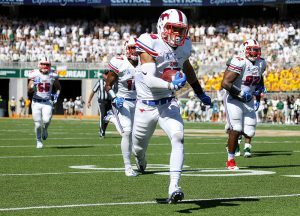 SMU Mustangs defensive back Jordan Wyatt (15) returns an interception down the field against the Baylor Bears at McLane Stadium in Waco, Texas. 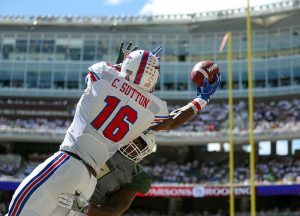 SMU Mustangs wide receiver Courtland Sutton (16) attempts to make a leaping catch over a Baylor Bears defender but it’s broken up. Sutton led the Mustangs in receiving yards with 112. 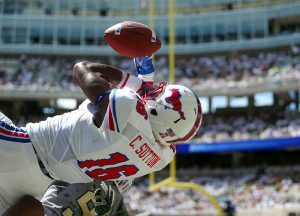 SMU Mustangs wide receiver Courtland Sutton (16) bobbles a catch in the end zone during the first quarter at McLane Stadium in Waco, Texas. Baylor Bears safety Orion Stewart (28) celebrates after an interception against the SMU Mustangs at McLane Stadium in Waco, Texas. 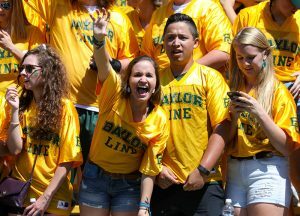 Baylor Bears cheerleader celebrates after a touchdown at McLane Stadium in Waco, Texas. 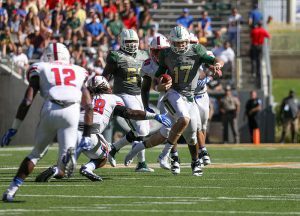 Baylor Bears quarterback Seth Russell (17) scrambles out of the pocket against the SMU Mustangs during the third quarter at McLane Stadium in Waco, Texas. 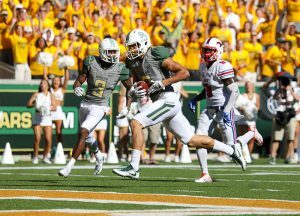 Baylor Bears wide receiver Blake Lynch (2) trots into the end zone for touchdown against the SMU Mustangs at McLane Stadium in Waco, Texas. 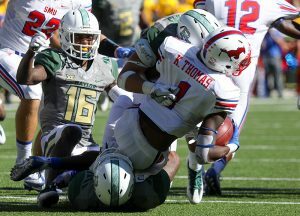 SMU Mustangs wide receiver Kevin Thomas (1) is tackled by two Baylor Bears defenders in the third quarter at McLane Stadium in Waco, Texas. 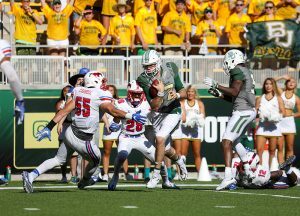 Baylor Bears quarterback Seth Russell (17) sidesteps an attempted tackle by SMU Mustangs linebacker Carlos Carroll (55) for a touchdown during the third quarter at McLane Stadium in Waco, Texas. Baylor Bears safety Orion Stewart (28) celebrates a pick six with his teammates during the second half against the SMU Mustangs at McLane Stadium in Waco, Texas. 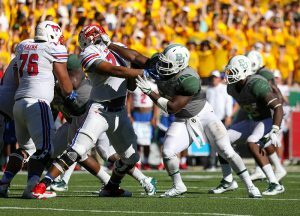 SMU Mustangs offensive lineman Chauncey Briggs (71) is stiff armed by a Baylor Bears defensive lineman during the second half at McLane Stadium in Waco, Texas. 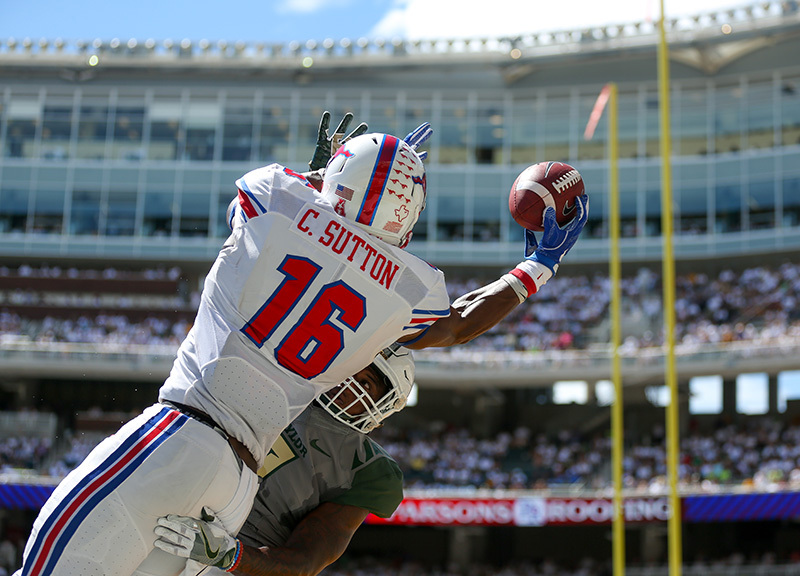 SMU Mustangs wide receiver Courtland Sutton (16) scores a touchdown against the Baylor Bears during the second half at McLane Stadium in Waco, Texas. 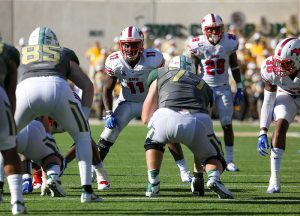 SMU Mustangs linebacker Kyran Mitchell (11) eyes the Baylor Bears backfield pre-snap at McLane Stadium in Waco, Texas. 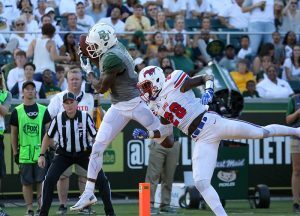 Baylor Bears wide receiver KD Cannon (9) catches a touchdown pass over SMU Mustangs defensive back Christian Davis (28) during the second half at McLane Stadium in Waco, Texas. 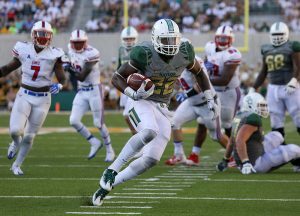 Baylor Bears running back Terence Williams (22) breaks into the SMU Mustangs secondary and jukes a defender during the second half at McLane Stadium in Waco, Texas. 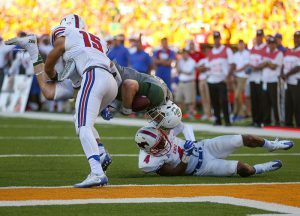 SMU Mustangs safety Mikial Onu (4) and defensive back Jordan Wyatt (15) upend Baylor Bears quarterback Seth Russell (17) near the goal line during the fourth quarter at McLane Stadium in Waco, Texas. 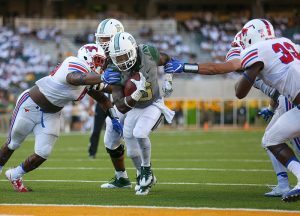 Baylor Bears running back JaMycal Hasty (6) breaks through attempted arm tackles by SMU Mustangs defenders for a touchdown at McLane Stadium in Waco, Texas. 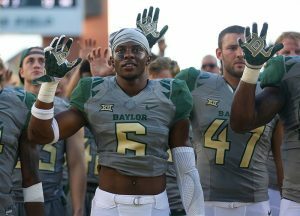 Baylor Bears safety Henry Black (6) celebrates after a 40-13 victory over the SMU Mustangs at McLane Stadium in Waco, Texas.